If you see numerous commercial advertisements when you access online stores, you might have ShopNDrop on your PC. It is an adware application that is supposed to display useful shopping offers and discount coupons, but in reality it interferes with your web browsing process by flooding your browser with annoying ads. Not to mention that ShopNDrop is highly vulnerable to a third-party exploitation, so it raises particular security concerns that cannot be overlooked. Thus, you simply must remove ShopNDrop from the system; otherwise you will not be able to avoid obnoxious pop-ups each time you access the Internet. You might be wondering where ShopNDrop has come from because you most certainly do not remember installing the application directly. That is not far from the truth. There is no direct download link for ShopNDrop, so this program always arrives bundled with freeware, and users most probably do not even notice that they install more than just one application. What is more, our security specialists say that the installer file for ShopNDrop usually hides behind fake download buttons that you may encounter on file sharing websites, torrent and p2p pages. In other words, such freeware distribution method puts a lot of responsibility on user’s shoulders as well. 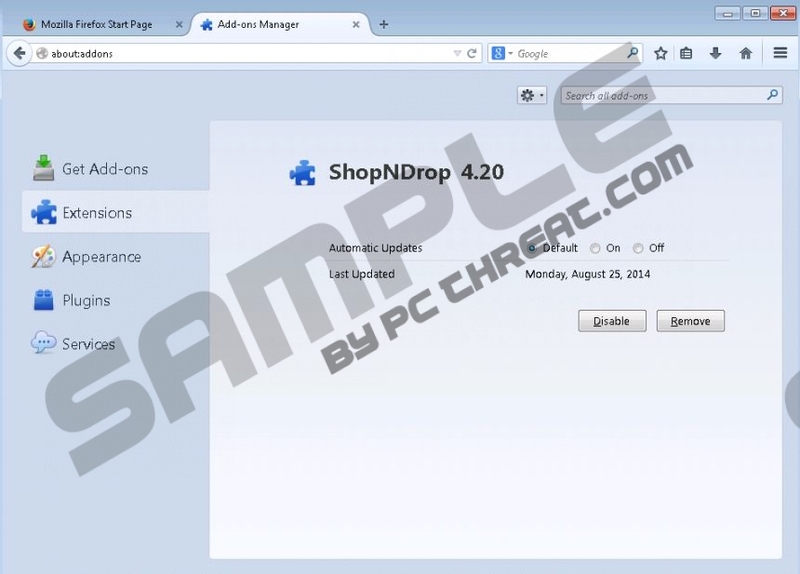 We have seen similar applications before as ShopNDrop is a semi-random name adware, and it is directly related to Deal4me, Deal4Real, CoupExtension, SaveNShop and other adware apps. All of these programs are based on JustPlugIt engine. Just like its predecessors, ShopNDrop also gets distributed through InstallRex and sometimes Amonetize or Vittalia installers. Once you install this program onto your computer, it may randomize its name from installation to installation. Hence, the possible name variants for ShopNDrop include SHopNdrop, shopndropp, shopandrop, shoppndirOp and many others. However, different name variation does not change the way this application behaves. ShopNDrop is compatible with Internet Explorer, Google Chrome and Mozilla Firefox web browsers. Upon the installation, it adds extensions that later on allow the app to display commercial advertisements. Needless to say, ShopNDrop does not review the ad content, as it relies on third-party advertising network to generate the links that are embedded in the ads. Consequently, even malevolent third parties could make use of ShopNDrop to promote their corrupted content. Thus, you would not be able to blame the application for exposing you to dangerous websites as it is not liable for third-party content. If you want to avoid various annoying nuisances and potential computer security threats, you have to uninstall ShopNDrop right now. Follow the manual removal instructions below this description and you will be able to restore your browser settings to default. After manual removal, please scan the PC with SpyHunter free scanner because you have to make sure all the unwanted files and programs have been deleted for good. Invest in a reliable antispyware application if need be. Drag mouse cursor to the bottom right corner of your screen. Select Uninstall a program and remove ShopNDrop. Select Add or remove programs and uninstall ShopNDrop. Disable and remove ShopNDrop from Extensions. Press Alt+F and go to Tools. Open Extensions and remove ShopNDrop. Quick & tested solution for ShopNDrop removal.